The Nokia 700 is a hot mini. Sub-centimeter slim, it keeps its weight under 100 g. At just 110 x 50.7 x 9.7 mm and 96g, this compact smartphone is simple and to the point, pure class. A mix of plastic and metal, the Nokia 700 is stylish and well built. Some design cues taken from the Nokia X3-02 Touch and Type are used well. The smooth polished edges are great to touch, the super slim elongated body handles very nicely. The Nokia 700 looks class without overdoing it. Design is clean, uncluttered, ergonomics - excellent. The Nokia 700 is touted as the company’s most environmentally-friendly handset to date. Internals are made of recycled materials and bio-based paints are used for the finish. 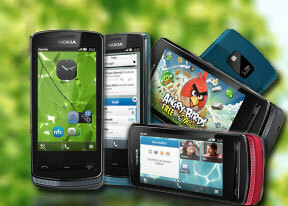 Nokia claim 60% use of sustainable eco-friendly materials. The Nokia 700 comes with a 2mm charger in the box and is said to have many features that reduce power consumption. Our test unit is the silver-white color combo but a selection of paintjobs will be available: Cool Grey, Coral Red, Peacock Blue and Purple. The front of the Nokia 700 features the 3.2" nHD (360x640) ClearBlack AMOLED display. It has very high pixel density of around 229 ppi and offers great contrast and very deep blacks. Colors are very nicely rendered but we feel the screen could've been a little brighter. There’s no problem using the Nokia 700 outdoors on a bright sunny day so no harm done. Above the display you'll find a proximity sensor to disable the screen during calls and what appears to be an ambient light sensor. There's a slim earpiece at the very top, with the Nokia logo underneath. Below the display there are three hardware buttons: the Call keys and a centrally-placed Menu button. The press is good, except in the Call key, which is abnormally stiff but this could be just our unit being a pre-market sample. At the very bottom of the front there's the loudspeaker grill - a strong design accent at that. It covers the entire bottom, with holes etched out into the metal plate. It's also where the primary microphone is located. The right side of the Nokia 700 features a total of 4 buttons. The volume rocker is at the top, followed by a lock button and the shutter key. All of them are very thin but sufficiently raised. On such a small handset the lock/unlock button would've been more comfortable at the top perhaps. The Nokia 700 has a fixed-focus 5 MP camera, so the shutter key doesn't have half-press. The left side of the Nokia 700 offers no controls whatsoever but emphasizes the design of the handset - the three sheets of plastic and metal form an asymmetrical pattern that looks good. At the top, there are two connectivity ports that can both be used for charging: standard 2mm charger hole and a microUSB port. There's also a 3.5mm headphone jack so you could use any set of earphones with the Nokia 700. The bottom of the phone holds the lanyard eyelet only. It's where the "chin" formed by the loudspeaker is most obvious. The back of the Nokia 700 is a mix of plastic with a metal back panel – a replica of the X3-02 Touch and Type. There's a secondary microphone for active noise cancellation at the bottom. At the top you'll find the 5 MP fixed-focus camera lens with a small LED flash. There's a latch to open the back panel. Doing so reveals the SIM slot, the 1080mAh Li-Ion battery and the MicroSD card slot. The battery of the Nokia 700 is quoted at 465h/450h standby and 7:10h/4:30h talk time (2G and 3G). Music playback is said to go as long as 47h. Ours is a pre-market unit so we can't give you details on battery life. The Nokia 700 is a design-driven device. Sure it doesn't serve up the latest tech but looks great and feels very solid and comfortable in your hand. We're very pleased with the ergonomics too. When you light up the beautiful ClearBlack display the whole package looks premium - and we can give Symbian Belle OS credit on this one too. But more on that after the break.